Load Trail was previously charged with knowingly hiring illegal workers. 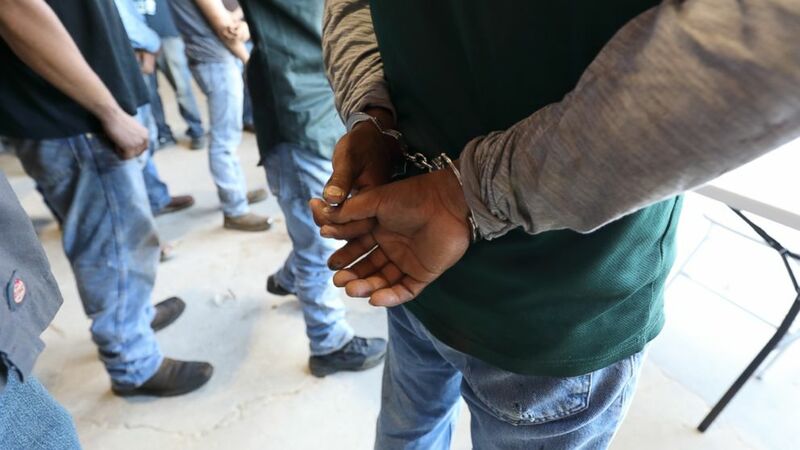 Federal authorities detained well over 100 undocumented workers on Tuesday in a surprise raid at a Texas manufacturing company. U.S. Immigration and Customs Enforcement (ICE) detained 160 workers at Load Trail, a trailer manufacturing company that was previously charged with knowingly hiring undocumented immigrants for labor, federal authorities said. The workers were taken into custody on Tuesday afternoon as Texas agents executed a criminal search warrant at the company’s Sumner, Texas, facility, located about 100 miles northeast of Dallas. (US Immigration and Customs Enforcement ) ICE detained 160 workers at Load Trail, a trailer manufacturing company in Texas. “I know I just heard helicopters everywhere and I saw a whole lot of people running and so I turned to run and the first corner I hit I got guns drawn down on me,” one witness said. The search involved multiple helicopters and more than 300 federal agents from New Orleans, Houston and San Antonio, according to Katrina Berger, Homeland Security's special-agent-in-charge of investigations. She said the agency launched its investigation after receiving a tip that Load Trail may have knowingly hired illegal immigrants, including some who were allegedly using fraudulent identification documents. “[W]e’re watching and we’re coming,” she said. "Businesses that knowingly hire illegal aliens create an unfair advantage over their competing businesses. (US Immigration and Customs Enforcement) Load Trail was previously charged with knowingly hiring undocumented immigrants for labor. “In addition, they take jobs away from U.S. citizens and legal residents, and they create an atmosphere posed for exploiting their illegal workforce,” she added. Load Trail Trailers agreed to pay a $444,993 fine for “knowingly hiring and continuing to employ unauthorized workers,” in 2014, Dallas ABC affiliate WFAA reported, citing federal records. The company allegedly employed 179 unauthorized workers at that time, according to WFAA. Load Trail currently has more than 500 employees and received an award for the “Fastest Growing Trailer Brand of the Year” in 2014 and 2015, according to its website. It did not immediately respond to ABC News’ email requests for comment. WFAA said it sent multiple requests for comment via phone and email, but the company did not respond. The undocumented workers were being held at detention centers Dallas and Oklahoma, where they'll be interviewed, fingerprinted and processed for deportation, ICE said.